"The aroma of the lime is so good, and when you cook it it fills the kitchen and people come-a-running. I accompany this with southwest-style rice." Whisk orange juice, lime juice, olive oil, garlic, dried onion, oregano, cilantro, salt, and black pepper together in a bowl until marinade is smooth. Measure out 1/4 cup of the marinade and set aside. Pour remaining marinade into a resealable plastic bag, place chicken in the bag, squeeze out excess air, and seal the bag. Marinate chicken in the refrigerator for at least 30 minutes. Cook and stir chicken in a large skillet over medium-high heat until lightly browned and cooked through, 3 to 7 minutes. Transfer chicken to a plate. Cook and stir pepper and onion in the same skillet with reserved 1/4 cup of marinade until vegetables are tender and liquid is reduced, about 5 minutes. Return chicken to skillet; cook and stir until heated through, 2 to 3 minutes. Spoon chicken mixture into tortillas. You can substitute red bell pepper for green bell pepper, if desired. I used fresh cilantro and onion as I prefer fresher ingredients if available and this turned out great! Outstanding and simple. Thanks for sharing. Loved it…used all fresh ingredients. Can this be made using steak? To make steak fajitas..because the recipes I have found do not compare. Delicious! 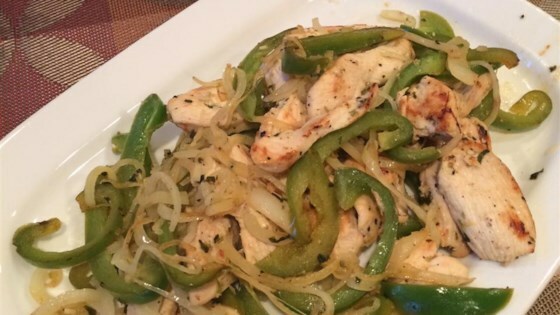 We loved the light flavor of these fajitas and the citrus flavor came through even when reheated the next day. I followed the recipe exactly and marinated the chicken about 3 hours. The flavors smelled great, but they really didn't come through in the dish. I think it was too liquidy.